You are playing in a multi-deck game, with all the "standard" rules in effect. 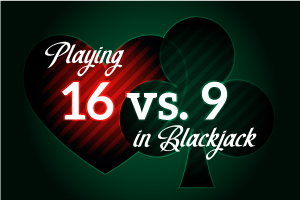 You're dealt a King and a six for a two card total of 16, while the dealer turns over a nine as his upcard. Your decision here is to hit or stand on your 16, which is obviously not the most enviable position to find yourself in. But you've got to do something, so what is it going to be? Well, it's not big fun, but the correct to play to make is to hit on the 16. When you think about it, this play really should be automatic. Remember, in all likelihood you are not going to beat the dealer by standing pat. The nine is a very good upcard for the dealer to have. With it he'll be able to make 17 or better 77% of the time, and 19 or better at a 53.5% rate. So if you stand, you'll lose on those 77% of hands, and in hitting, you'll lose only 72% of the time. Keep in mind that this is a defensive play and that the play is not intended to yield a profit, but to expose you and your bankroll to less of a loss. In cases where you stand to lose, it's not only the wisest course of action, it's the ONLY course of action. Don't be afraid to hit even if it looks like you're almost certainly going to bust. You've got to do it anyway.